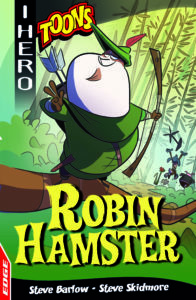 This is a BRAND NEW iHero series! 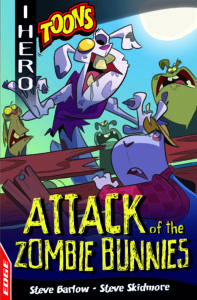 We know you all love the exciting adventures in our iHero books, but this this time we thought we’d go FUNNY! We love cartoons so we thought, why not have a hilarious, cartoon-based, choose-your-own-destiny adventure story, which is going to make you all howl with laughter! There are six titles coming out over the next few months. They are illustrated by the rather brilliant Lee Robinson – we love what he’s done! 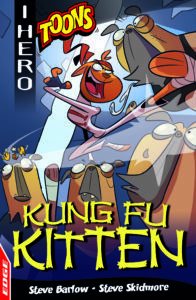 So now you are going to have the chance to become your very own cartoon hero in these fully interactive, wacky, choose-your-own-destiny adventure stories. You are a kitten in a down town neighbourhood. The neighbourhood is ruled by Bully the Bulldog and his gang of Ugly Pugs. 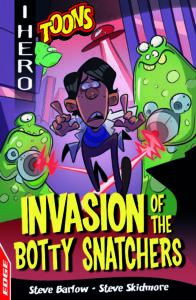 Earth is under attack from a bunch of no-good botty pinching aliens. It’s Pantsageddon! YOU must help the commandoes find a way to stop the snatchers, or it’s the end of us all! 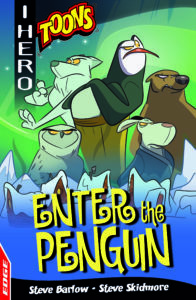 You are a ninja penguin. When a horde of polar bears and sea lions descend on your village and demand the fish harvest, you must assemble a team of desperadoes to defend it. 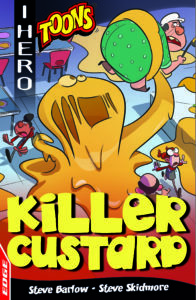 You are suspicious of the new dinner lady at school – suspicions that are confirmed when the custard she is making comes alive and begins to terrorise the staff and pupils… Can you stand up to the custard or will it all go lumpy?